An exhibition of photographic work by senior Emily Carr College students, it is intended to address some of the crucial issues on our minds as we enter the final decade of the 20th century, and rapidly approach 21st: concerns related to the environment; cultural, gender identity; the significance of the family and its role in shaping our identity; human rights; and the all-pervasive effects of power and politics. 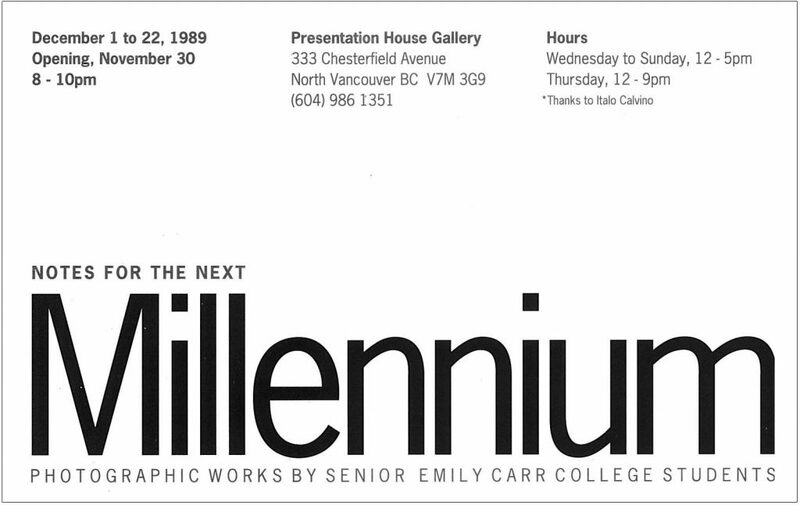 Organized in cooperation with the Photography Department at Emily Carr College of Art & Design, and supported by the Leon and Thea Koerner Foundation in Vancouver. Accompanied by posters produced by the ECIAD.